Winning the Nobel Prize for Literature in 1934 for his groundbreaking work in theatre by challenging its conventions in breaking “The Fourth Wall,” Luigi Pirandello not only influenced the likes of Samuel Beckett and Edward Albee, but current aspiring playwrights and poets like the talented Adam Seelig. Based on the original play by Italian dramatist Luigi Pirandello (Come Prima Meglio Di Prima-Like Before, Better than Before), Like the First Time, written and directed by the already accomplished Adam Seelig and produced by his company One Little Goat, is a play with a contemporary theme and a stellar ensemble of actors. Certainly not an easy feat, Seelig must have collaborated with Italian translators to dissect Pirandello’s original Italian work from the 1920s. Seamlessly staged, meticulously acted and intricately written, Like the First Time, was the first time I had seen a Pirandello “type” play performed and won’t be the last. The play begins with Fulvia (Cathy Murphy) the protagonist of the play, staring aimlessly in the audience, creating the illusion of hanging elegantly from a chandelier draped in an exquisite black laced fabric piece. We soon learn that Fulvia is torn between returning to her unfulfilled life 13 years ago, married to Silvio and leaving a child behind to living a more honest and liberated life with Marco. As Marco (Dov Mickelson), one of Fulvia’s many lovers, enters the stage, he breaks “the Fourth wall” for the first time and speaks to the audience about his unconditional, almost obsessive love for Fulvia. The convention of breaking “the fourth wall” in theatre means to blend reality (the audience) and fiction (the characters in the play) together. Therefore, the invisible boundary that separates the audience from the characters on stage becomes intermittent at various points in the play. Cathy Murphy’s portrayal of Fulvia is honest, strong, controlled and vulnerable at the same time as the character of Fulvia is meant to be, at least from my perspective. Dov Mickelson gives a passionate and heartfelt performance in the physical and emotional demanding role of Marco. Then we meet Silvio (Andrew Moodie), Fulvia’s husband who yearns for Fulvia to return to him and their daughter Livia. Moodie plays his role with consistent intensity. Appearing very direct and unsympathetic at times, the character of Silvio is the perfect contrast to that of Marco’s character. Near the first half of the play we are introduced to Fulvia’s aunt, a pseudo mother to Fulvia, encouraging Fulvia to return to her old life. Elva Mai Hoover is gentle and nurturing as the character of Auntie Ernestina, struggling to hide the truth from Livia, honestly portrayed by Jessica Salguerio, the undoubtedly resentful daughter. Laird MacDonald’s effective lighting choices and Jackie Chau’s simple yet adaptable set design is perfect for this 90-minute non-stop play of continuous dialogue in which all the costume changes and set transformations flawlessly take place within the action of the play on stage. Although it may be difficult to understand why a parent would want to selfishly abandon their child, one cannot judge one’s circumstances or internal struggles. Given the play was modelled on Pirandello’s original piece, one can begin to understand the pressures and societal demands women may have had to endure back then, a sentiment which may still hold true for many today. Making Pirandello a little more accessible to all, Like the First Time produced by One Little Goat is worth seeing simply for its outstanding performances and uniquely written adaptation. 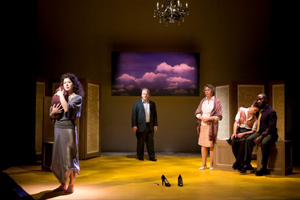 –Like the First Time produced by One Little Goat will be playing at the Walmer Centre Theatre in Toronto (188 Lowther Avenue) from October 28th until November 13, 2011, Tuesday through Saturday at 8pm and Sundays at 2pm (Pay what you can). – Tickets cost $20 for adults and $15 for students and seniors for the first week of the run and $23 for adults and $18 for students, seniors and artists in the final week of the run. Photograph of Cathy Murphy, Dov Mickelson, Elva Mai Hoover, Jessica Salgueiro, and Andrew Moodie were taken by Yuri Dojc.